The Mya Gyro Hookah stands an impressive 29 inches tall and features a beautifully ornate cloisonne shaft. 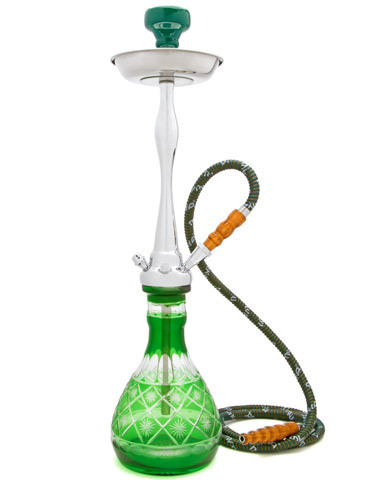 Available with up to 4 hoses, the Gyro is a perfect hookah for smoking alone or with a large group. As with all Mya Hookahs, the craftsmanship and attention to detail that goes into making these hookahs cannot be beat amongst modern styled hookahs. The Mya Gyro will come with matching 6 foot Mya cloisonne hoses as well as all of the accessories listed below. 29" MYA Gyro Hookah has a average rating of 0 stars out of 5 stars based on 0 reviews. Q: When will the 29" Mya Gyro be back in stock?